You’ve just started your first class of graduate school and, instead of prepping for an end-of-quarter test or essay, you’re given a real-world imperative: crafting a social media storytelling strategy and proposal for the King County Prosecuting Attorney’s (KCPA) office. Sound daunting? 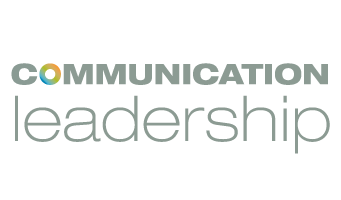 For most new grad students, probably, but it’s par for the course for Cohort 14 of UW’s Communication Leadership program, which wrapped up its first core class, Communication Through Digital Media and Networks, on Saturday, November 15th. 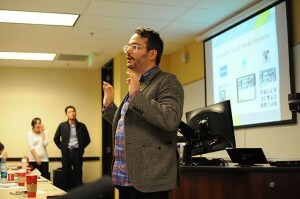 The final class also featured lectures from Comm Lead instructor John du Pre Gauntt on the Internet of Things, and VP of Global Digital Marketing for Starbucks, Alex Wheeler, who closed out the day with an inspiring presentation that showed how Starbucks uses storytelling to do more than just sell coffee. Class instructors Hanson Hosein and Brent Friedman assigned a total of 10 social media platforms to groups of 4 to 5 students at the beginning of the quarter. Student groups then spent the bulk of the final class giving 10-minute presentations describing their assigned platform and providing the KCPA, as well as investigative journalism site Who What Why, with an overview of their storytelling proposal for consideration. Both organizations approached Hosein prior the start of the quarter for assistance in growing their social media presence and had representatives attend the final presentations. Each student group took on a different social media platform and educated the larger group on the benefits and drawbacks of using the platform for their proposed storytelling campaign. The highly visual proposals were the culmination of the students’ learnings in storytelling strategies, and independent research on their assigned social media platform. After each student group presented, Hosein led a Q&A session for clients, students, and faculty members to express concerns and get clarification on each proposal. The biggest learning from a storytelling perspective? The importance of being platform agnostic and that content should do more than drive engagement — it should make you feel something. 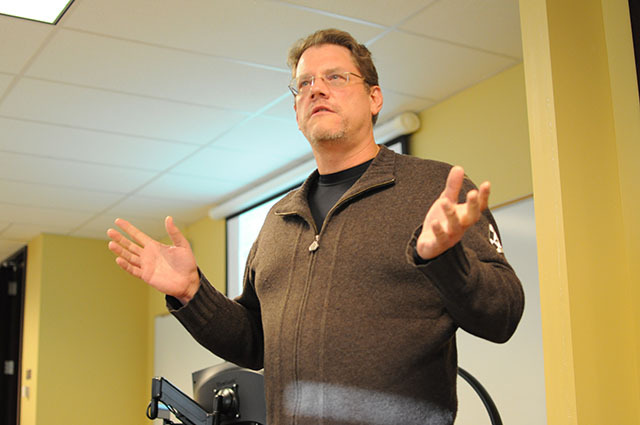 After the student presentations, John du Pre Gauntt, a Comm Lead instructor and founder of Media Dojo, discussed a coming “revolution of connected objects” and the demands it will put on public privacy, as well as what could be found on this voyage of discovery. He saw storytellers as Columbus in this scenario, seeking out India but instead finding the Bahamas – discovering a new world of technology that has jumped from the screen into our real lives. But, as he pointed out, we have relationships with inanimate objects already, for example we name our cars and assign them personalities. Our relationships with inanimate objects will only continue to grow with the Internet of Things, and Gauntt believes storytelling will help define this new connected world. 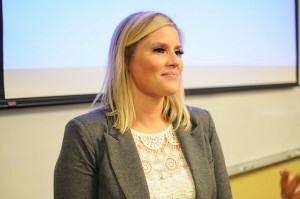 Alex Wheeler offered insights into Starbucks’ storytelling philosophies to the room, beginning with their mission statement “To inspire and nurture the human spirit – one person, one cup and one neighborhood at a time.” Wheeler expressed pride in her company’s ability to create the passion and engagement around their products and brand, and the core values behind them. Her six community managers try to amplify existing behaviors on Twitter, Instagram, Youtube, and now Snapchat, with campaigns like #sipface. People were already posting images of their faces with lips puckered around the green straw in a Starbuck’s Frappuccino, the team just gave it a hashtag and a name. With respect to their fairly new presence on Snapchat, Wheeler proudly stated that they “broke” the platform with their Red Cup campaign which drove the sharing of 3 to 4 images every second, beyond what the fledgling image-sharing platform could handle. Wheeler also shared the recent “Meet Me at Starbucks” videos her team created on one day in 28 Starbucks locations around the world. The video series explores all the reasons people come to Starbucks and attempts to drive home the point that Starbucks is the world’s “third place” away from home and work. By the end of Wheeler’s presentation red Starbucks cups filled the classroom. A fitting end for an epic day of presentations, and a great celebration of storytelling and storytellers alike.